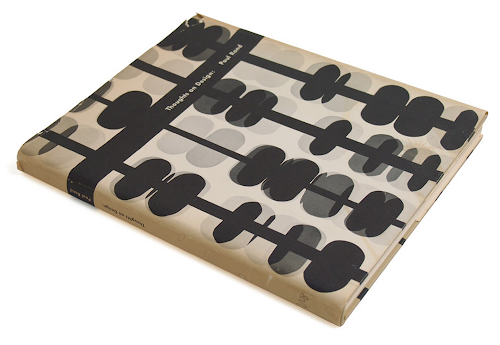 It's been out-of-print for the best part of ten years, but Paul Rand's 'Thoughts on Design' is finally available again. With 164 pages (featuring 94 halftone illustrations and 8 colour plates), this book explains Rand's ideas about the role of design in the world, and shows how symbols and type, underpinned by strong conceptual thinking, can be combined to create the pure and clear kind of visual communication that we're all familiar with in modern branding and corporate identity. Rand's philosophy is summed up in his most well-known quote - "Simplicity is not the goal. It is the by-product of a good idea and modest expectations" - and of course he has plenty of brilliant examples of his work to back this up - ABC, IBM, UPS, Westinghouse and Enron to name but a few. Along with Reid Miles and Lester Beall, Paul Rand was a leading proponent of an Americanised commercial approach to the Swiss Style, and this little book is a must-read for all students of design. You can order it on Amazon for about £12 in paperback and £8 on Kindle. And as a taster, read Michael Bierut's introduction to the new edition, 'Thoughts on Thoughts on Design'.